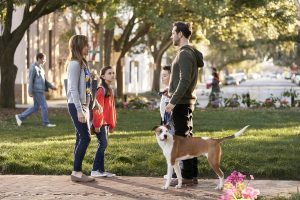 Nikki DeLoach joined the Hallmark family in 2015 and here at TV Goodness, we’ve regularly covered her films and talked with her tribe of co-stars (Lisa Durupt, Andrew Walker, and Luke Macfarlane), so it only seemed fair to finally chat with her, too. 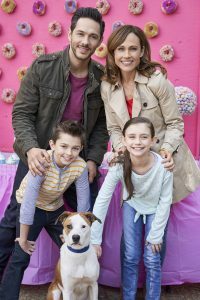 Saturday night DeLoach returns to Hallmark Channel for the premiere of Love to the Rescue, a really sweet, kind story about two single parents, animation creative director Kate (DeLoach) and department of transportation planner Eric (Michael Rady), whose children fall in love with the same dog, Bruce, at their school’s adoption event. Put in an awkward spot made even moreso when Eric ropes Kate into helping with the spring carnival, they agree to time-share Bruce for a month to see who gets to keep him. Over that month, they become friends who bolster each other’s professional ambitions and discover that Bruce isn’t the only one whose life can be changed by an open heart. I spoke to DeLoach this week about the new project, and next month’s Hallmark Hall of Fame, Love Takes Flight, which she’s filming now in Savannah, Georgia–where Love to the Rescue was also filmed. We’ll have more on that ahead of the movie’s premiere in April. In the first part of our chat, we talk about Love to the Rescue, working for Hallmark, and producing her own projects. 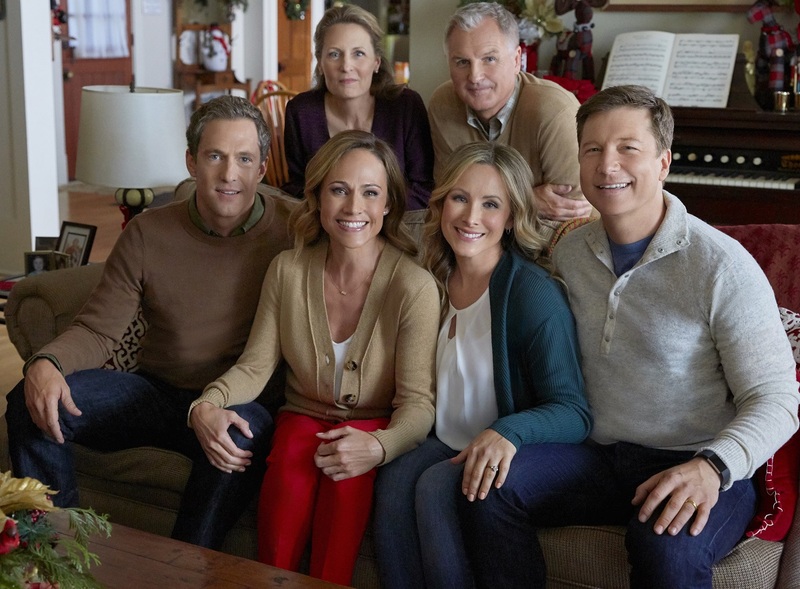 Love to the Rescue marks the third time DeLoach has worked with director Steven R. Monroe, who directed The Perfect Catch and Reunited at Christmas, which DeLoach produced. He’s also directing Love Takes Flight. DeLoach says at this point they’re a package deal whenever possible. “Steven and I love working together. There’s definitely a shorthand. Even today, he was asking me [to make a change] and I already knew [what he wanted],” she explains. 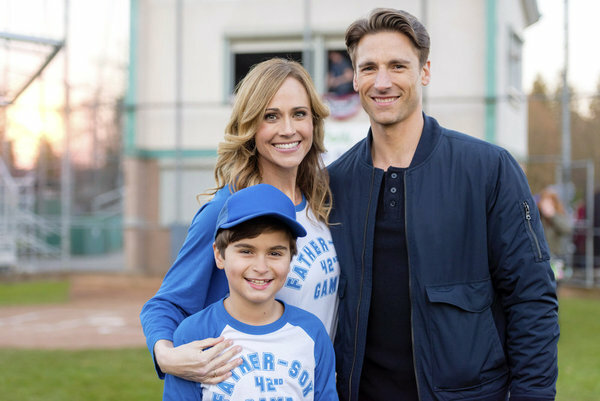 “When I first worked with him on The Perfect Catch, I was early on in my pregnancy and we were doing a spring baseball movie where we had to be outside on the diamond for a substantial percentage of the movie. It rained, sleeted, snowed, and hailed every day of filming except the Saturday we had off,” she laughs. DeLoach was thrilled to develop and produce Reunited at Christmas,and says it’s something she’s been driving toward since the beginning of her career. “I love producing. From day one, it was not just acting for me. It was about storytelling and being a part of the whole process. I love taking the seed of an idea and building something around that,” she shares. 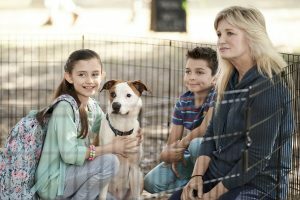 Love to the Rescue tested the old adage about working with kids and animals, and DeLoach says the kids—newcomers Michaela Russell, who plays Kate’s daughter, Sophia, and Max Ivutin, who plays Eric’s son, Owen, were awesome, but the dog, Zip, need a little time to get used to working on camera. “The kids were on point. They knew not just their lines but everybody’s lines,” she says. Sarah Montana wrote the film, and has a role as one of the animators who works for DeLoach’s Kate. DeLoach loved the script, and as she learned more about Montana, she loved her, too. “I’m going to brag on our Sarah. She’s gone through some really tough things in her life. She lost her mother and brother when she was 21 at the hand of a person that knew them,” she explains. 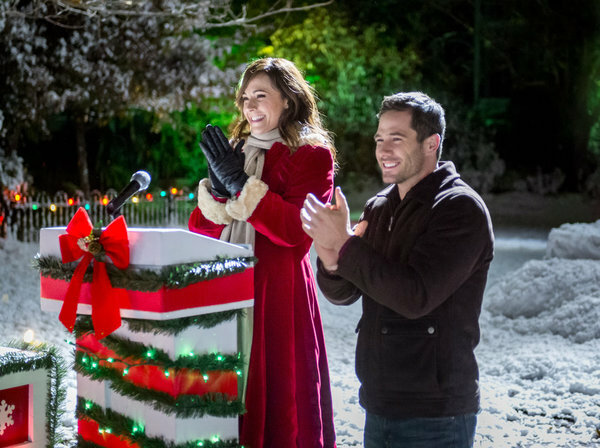 Love to the Rescue premieres Saturday at 8 pm/7c on Hallmark Channel. DeLoach plans to live Tweet during the film. You can also find her on Facebook and Instagram, and through her lifestyle blog, What We Are. Here are a couple of sneak peeks of Love to the Rescue. Check back in April for the second part of our interview! Photos and Video Courtesy of Crown Media.